It pays to recheck your original photo's. I was browsing through the Davidstow Dotterel images from last week and must have overlooked this one. I like the focus directly on the eye and the dew drops in the grass. EXIF Detail: F/7.1 Shutter 1/100s. ISO 400. Exposure -0.3EV with 0.3 EV added post processing. Focal length 840mm. Lovely photograph Steve. The dew drops do add to the overall effect. 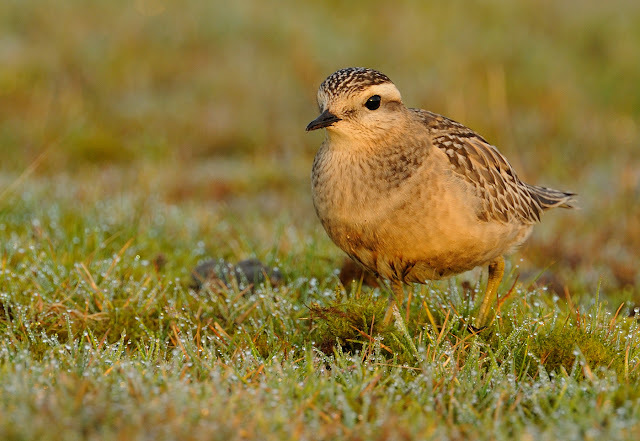 Your Dotterel images are outstanding Steve. Great shot Steve with the early morning light and the dew.